Solar thermal serving and maintenance should be carried out every year typically so that you know that your system is working efficiently as possible. Our team in London specialize in the Solar Thermal Maintenance and repairing of solar systems through out London and further a field if required. Systems from 3m² to over 300m² are currently under service plans with Williams Renewable to ensure simple break downs don’t turn into a major repair bill. 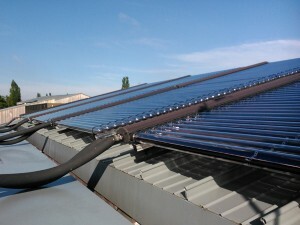 System pricing for Solar Thermal Maintenance is based on the size of your a ray and the complexity of the installation. We have worked on many Viessmann Solar Systems and we have a very good knowledge of their often very complicated control strategies. We can also support system from companies that are no longer trading in the UK like Genersys, Filsol and TiSUN. RESOL controllers have become the industry standard for most solar systems and with our own in house controls specialist we can also check other makes of controllers to ensure the system has been correctly set up by the commissioning engineer. The system pictured cost over £1,500 to repair due to a failed pump and been left for over 12 months, the system needed to have solar thermal system flushed with R200 Sentinel solar cleaner and refilled with Tyfocor glycol. Unlike boilers it is important that small repairs are not ignored as the system can not be turned off and left. Replacement vacuum tubes is often over looked during Solar Thermal Maintenance with system becoming as efficient as an “black radiator laid on the roof” so it is important that your maintenance staff know how to identify the signs of failed tubes, from the subtle change of the silver Barium indicator disappearing to the fogging and water sitting inside the vacuum tubes. If you do not have the staff on site we will carry out on site inspections and advise you if you require any replacements. Call us today to discuss your Solar Thermal Maintenance requirements.